US customers only: VH Audio has a limited quantity of Synergistic Research demo cables available at 60% off MSRP. All cables are in new condition. Expose the drop-down menu above to see all available options. Interconnects are sold in pairs, and only ONE pair is available in each type and length. 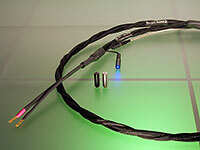 VH Audio has a limited quantity of Synergistic Research dealer demo Speaker cables available at 60% off MSRP. All cables are in new condition. Cables are terminated with BANANA connectors, and are 8 ft in length. Speaker cables are sold as pairs, and only ONE pair is available in each type. US customers only: VH Audio has the last 5 ft Synergistic Research CTS-D (Digital) dealer demo Power cable available at 60% off MSRP. Cable is in new/unused condition. Cable is terminated with 15A male and 15A IEC connectors, and is 5 ft in length.